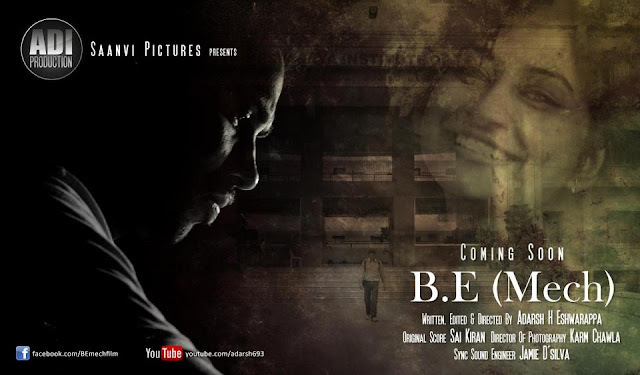 I attended the screening of Kannada movie, B.E. (Mech), directed by a software engineer, Adarsh H Eshwarappa, at KH Kalasoudha, Hanumanth Nagar, Bangalore, today. The theme of the movie is "Of An Eternal Romance Between A Man & His Dreams..!!" Cast: Rachana KG, Nanjunda Murthy Rao, Pavithra Venkatesh, Rashmi Shanbogh, Adarsh H Eshwarappa. The story is about a young guy, Adi aka Adithya (Adarsh Eshwarappa), who has completed his Diploma and strives day and night to fulfill his dream of becoming an Engineer by obtaining a seat at a reputed college. Having lost his parents during his childhood and survived by his younger sister, the role played by Rashmi Shanbogh, he works as a dance instructor at a studio run by his friend, Loki (Nanjunda Murthy Rao), to make a living. Padma(Pavithra Venkatesh) is Loki's girlfriend and a good friend of Adi. Adi, who lives alone and is lonely, meets Meera (Rachana), the new joinee at the dance class. Adi is totally mesmerized by Meera and is love stuck. They spend time together even after the dance classes. He totally forgets about his engineering seat. But soon he realizes that it is just a one-way love and deeply hurt and his relationship his two friends fade turn sour.His life takes a twist with the new sufferings. The lead is played by Adarsh with the Rachana, actress in lead. The hero has a close friend, Nanjunda Murthy Rao. I found Adarsh and Nanjunda's dialogue delivery to be very natural and effective. All the actors have maintained a body language though the dialogues were not effective in some scenes. There is continuity and suspense maintained till the end of the story which would impress the audience. I liked the below song and found it on YouTube. Coming to the turnover, there was a huge crowd I noticed for the screening. Main lead, Adarsh to the left, in Black Tee. The movie has been shot mainly in Bangalore and a scene from Denver.